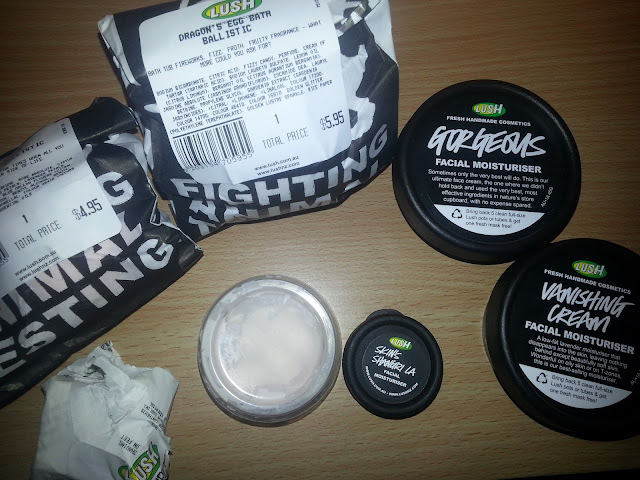 Lust The Beauty: LUSH Haul! I was only recently introduced to LUSH through my lovely YouTube beauty gurus and a friend who knows her way around the Fountain Gate shopping centre. I had no idea there was a LUSH store there! I'd watched on Zoella's YouTube videos (http://www.youtube.com/channel/UCWRV5AVOlKJR1Flvgt310Cw) that the Dragon's Egg Bath Ballistic was amazing. It has such lovely ingredients such as lemon oil and bergamot oil, jasmine and gardenia, as well as golden glitter and and orange colour in the middle. It is going to be such a lovely scent; uplifting and invigorating, whilst fizzing away, colouring the bath and making it all glittery! Ohh I can't wait to use this! The other bath bomb is called Rose Queen Bath Ballistic which is "a rose tinted spectacles bath, for times when all you want to see is the rosier side of life". Who doesn't think that sounds fantastic? Rosy smells are so calming and relaxing. This would be perfect for a cosy night in to relax and pamper yourself! Secondly, I bought two facial moisturisers. Okay, well, I bought ONE of them, and the other my boyfriend payed for (because he's a doll). The one I paid for is called Gorgeous. WOW this stuff is incredible. It smells heavenly and is really hydrating to the skin. I will be using this at night time as it is quite rich on my skin, and I wouldn't want to wear makeup over the top of it. I wake up after using this the night before and my skin looks bright, clean, fresh. OH it's just sooo good! I bought the tester for both Gorgeous and the Vanishing Cream when I was in LUSH last time, and just after a few days, I wanted the full sized product. Gorgeous has the longest list of ingredients ever, which include things like olive oil, avocado oil, evening primrose oil, grapeseed oil which are all Organic Cold Pressed, which means that basically the oils are in the best state to get the benefits from them. This skin cream might be $75 a pot, but my gosh is it good. The Vanishing Cream is great for skin-types like mine where I get oily during the day when I wear makeup and sweat, etc. This product is light on the skin and contains soothing and mild properties so its good oily/combination skin. This one only cost $39.95, but is still going to be part of my daily routine, as daytime moisturiser, with Gorgeous being my night time moisturiser. Because I spent SO MUCH money in there, the lady serving me gave me a free sample of a solid deoderant, which I'm still a little too scared to try, and a sample of the Dreamwash Shower Smoothie, which is a face wash. It is extremely thick and a light pink colour. It looks like it should be a face mask, but I just grab a small amount on my fingertips and massage into my face for a little bit and then leave to sit before washing off. 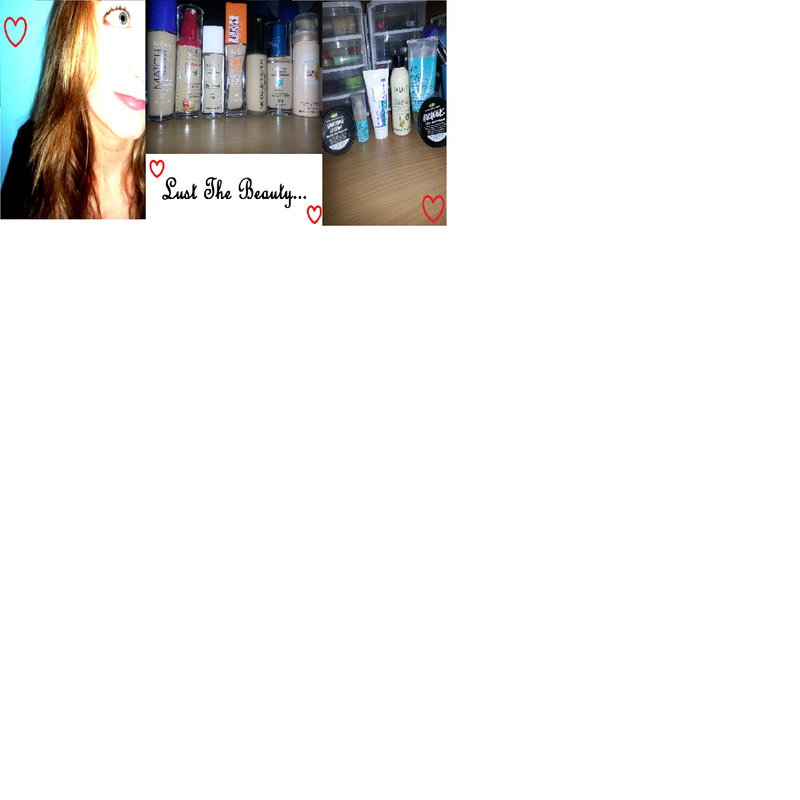 I also thought I'd buy their other tester they had for moisturisers which is called Skin's Shangri La. With Almond oil, Jojoba oil, Aloe Vera, Evening Primrose oil and Beeswax just to name a few, this moisturiser is soft and gentle on the skin, providing enough moisturisation without causing irritation to sensitive skin types. I haven't tested this one out yet, as I'm still hooked on my Vanishing Cream and Gorgeous, but when I do try it, I'll be doing a review. OH LUSH, why do you make me want to spend all my money on your products?! Definitely try LUSH out. Everything is homemade and organic, so although it may seem pricey, there are NO harsh chemicals in any of the products and everything is homely and beautiful. They will even give you a free facial and mask!